Truth Fellowship Live | Bismarck ND Church | Are you a frog in a world that needs lizards? Are you a frog in a world that needs lizards? The Great Commission (Matt 28:19-20) consists of evangelism and discipleship. We may not be gifted in both of these areas, but we are directed to do both. Evangelism seems to be the tougher of these two components for us to obey. That’s because evangelism is scary. Our fear to speak to others about the saving grace of God through Christ is often seen by the unsaved would as shame. Yet, we should not be ashamed of the gospel of Christ (Rom 1:18); rather, we should understand that apart from faith there is no way for anyone to come to Christ (Rom 3:28). “Have you ever noticed how differently frogs and lizards acquire their food? The frog sits and waits for the food to come to him, and when an unlucky insect happens to come by, he simply sticks out his tongue and reels it in. If the lizard sat around like the frog, however, he’d starve to death. And so he goes into his world and he hunts. Now the frog in this analogy is the vocational Christian worker. He goes off to seminary, he gets a degree, and he goes on staff somewhere. And before you know it ministry opportunities are coming to him, and he has his hands full. In fact, when big frogs come to town they hide out in hotel rooms or they’ll be swamped. But the lizard, on the other hand, is the layperson. Ministry does not come seeking him out. Instead he must move around his environment and assess his sphere of influence, establish friendships, serve people, and once he has earned the right to be heard, be ready to give an account for the hope that is in him. How do we become lizards in a world of frogs? Romans 10:9-10 says, “that if you confess with your mouth the Lord Jesus and believe in your heart that God has raised Him from the dead, you will be saved. For with the heart one believes unto righteousness, and with the mouth confession is made unto salvation.” When we really make it our goal to be transformed into the image of Christ we have no option but to give all glory to God and this is done by speaking about Him to others. After all, the best way for us to share our faith with others is to let the love of God flow through us. I go through all of this to offer up a challenge to us. I would like to use Truth Fellowship Live as an example. 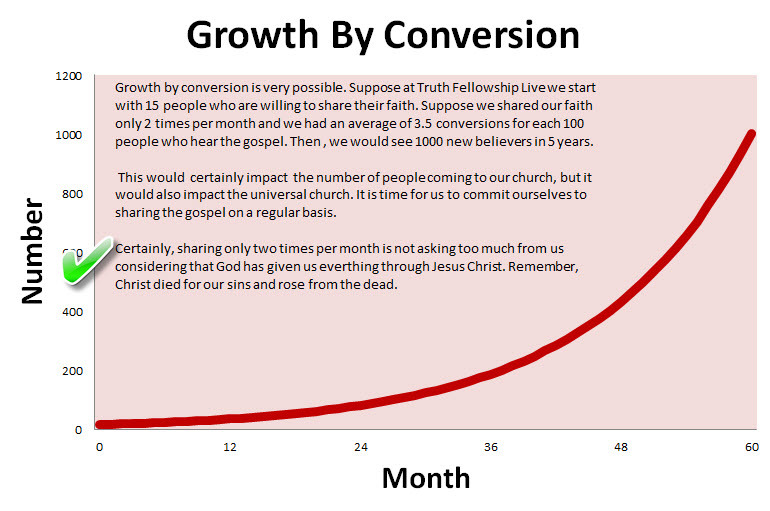 Above is a chart of potential church growth. I got this idea from Mary with EvanTell and modified it for us. Let’s start first with the assumptions. Suppose we have 15 people who are trained and willing to share their faith with those around them. We could be unrealistic and assume that they will share their faith with one or two people per day, but in reality, we know that will not happen. 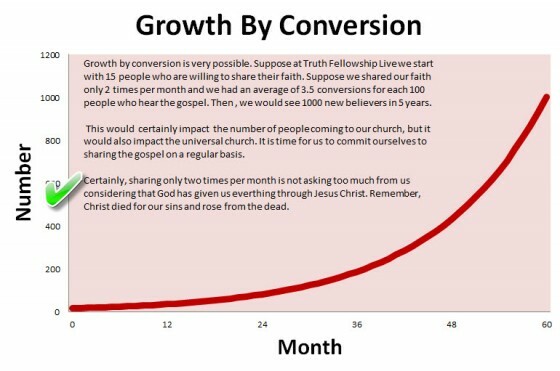 So, let’s be ultra conservative and say that each person will share their faith only twice per month. Finally, let’s suggest that out of every 100 persons who hear the gospel, 3.5 of them decide to trust in Christ for their eternal destiny. In just 5 years we will see 1000 new believers entering the kingdom of God through this initiative. To me that is a WOW! Many of these people will not join us at TFL, but the impact on the universal Church is incredible. And the impact on the lives of the people who get to witness the transforming power of Christ will be contagious. It is now time for us to commit ourselves to sharing the gospel on a regular basis. Certainly sharing our faith with others two times per month is not asking too much. After all, God has given us everything through Jesus Christ who DIED FOR OUR SINS AND ROSE FROM THE DEAD. Are you ready to stop turning the job of evangelism over to the frogs by becoming a lizard? 1 Kent Humphreys and Davidene Humphreys, Show and Then Tell: Presenting the Gospel Through Daily Encounters (Chicago IL: Moody Publishers, 2000). 28. 4 Replies to "Are you a frog in a world that needs lizards?" I’m SO glad you bring this up and present this to our church! My heart has been in this EXACT place!! Desiring for me personally and US as a church to be IN the world, but not of the world, sharing the GOOD NEWS!! And seeing many come to Christ!! Would love practical tips and ideas on HOW to be more effective in our neighborhoods and among the lost in our families and friends! Maybe we could do the EvanTell course for our adult Sunday school or in our small groups?? Yes–we will be doing EvanTell training this fall. We will offer the course at NPBS (14-15 weeks) and at TFL (4-hours). I will also be suggesting various activities that will get us into the community. Thanks for your encouraging comments. I say yes to that question. It is a bold command not a suggestion from God to verbally share the message of Salvation. Yes, it is a command. As I said in the post, we tend to believe we obey it by letting the “frogs” do the evangelism. This is the wrong attitude. It is us to us as members of the body of Christ to share what we know to be true with others. Our goal is to have our boldness overcome our fear in evangelism. We will work together to accomplish this.